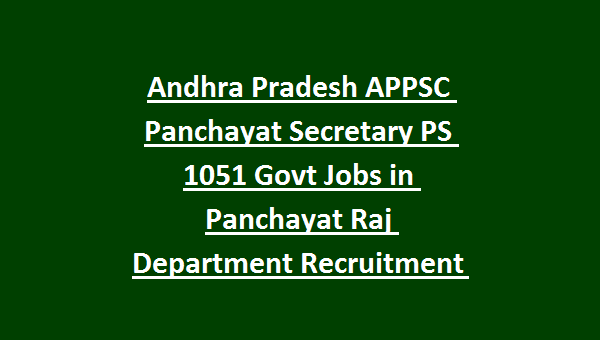 APPSC Panchayat Secretary PS Examination 2018: Andhra Pradesh Public Service Commission invites applications from the eligible candidates for the recruitment of available 1051 Panchayat Secretary vacancies of AP Panchayat Raj Subordinate Service. Application form submission last date online is 25-01-2019 for APPSC Panchayat Secretary PS Jobs Recruitment Exam. The selection for APPSC Panchayat Secretary Recruitment 2019 will be held in the different stage of screening/preliminary test and computer based online test followed by interview. Online applications will be accepted through APPSC portal of AP @http://psc.ap.gov.in. To apply online candidates must have OTPR One Time Profile Registration number. If don’t have OTPR then register @psc.ap.gov.in. For more details regarding APPSC PS Panchayat Secretary vacancy details, exam pattern and syllabus and more information is given below. Click here to see the official notification of Andhra Pradesh PS Panchayat Secretary Recruitment Exam. 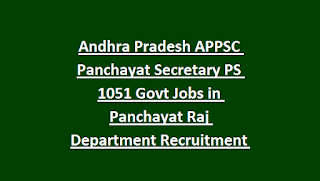 There are total 1051 vacancies available in Andhra Pradesh Panchayat Raj Subordinate Service. District Wise vacancy Details are given below..
Must possess a Degree from a recognized University. Selection process for Panchayat Secretary jobs will be through objective type computer based test and interview. If more than 25000 applications then a screening test will be conducted. For the candidates of General examination fee is Rs.120/- and application fee is Rs.250/- and for SC/ST/BC -Rs.250/-. No exam fee for SC/ST/BC. Fee payment online last date is 30-01-2017. Candidate who are qualified screening test they are only eligible for the mains test. For 1:50 based merit list will be prepared to write the mains examination. 1. General Studies Paper-Consists of 150 marks with 150 minutes duration. 2. Rural Development and Problems in Rural Areas with special reference to Andhra Pradesh- Consists of 150 marks with 150 minutes duration. Interested candidates may generate their OTPR number. If already generated then use the old number. One Time profile password registration can generate @psc.ap.gov.in. Submit application form online on or before the closing date of 25-01-2019. Click here to apply online for the ANDHRA PRADESH PSC Panchayat Secretary Recruitment Exam 2019. Please share this Andhra Pradesh Panchayat Secretary Recruitment 2018 article to your lovable friends through online via social web. What the education should be ?? ?